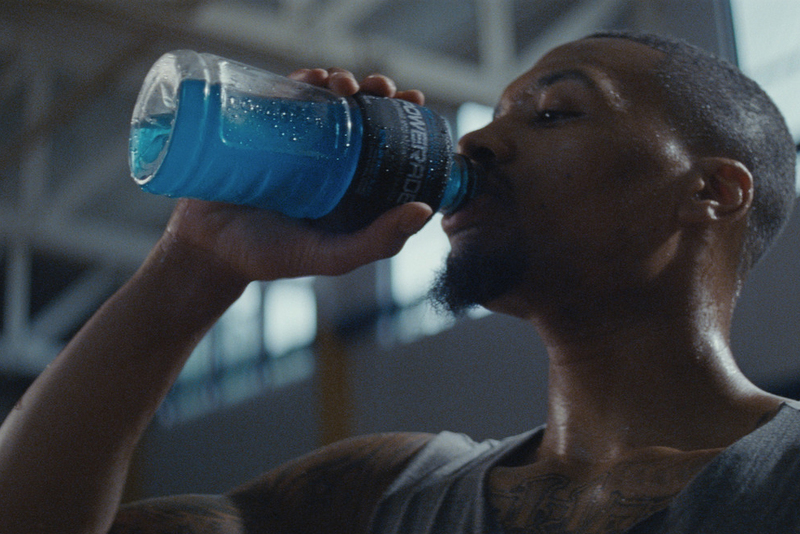 “Be afraid of what could happen if you don’t do your work.” Those are the words famed boxing trainer Virgil Hunter utters to Portland Trail Blazers guard Damian Lillard in a new Powerade commercial. The advice couldn’t ring truer. If Lillard and the Blazers don’t do their work, the franchise could miss the postseason for the first time since 2013. What could be considered Lillard’s best NBA season has been overshadowed by the Blazers’ disappointing one despite having one of the league’s highest payrolls. With about a month left in the season, Lillard and the Blazers finally seem to be hitting their stride in their quest to get the Western Conference’s eighth and final playoff seed after winning four straight games. And if Portland falls shy, Lillard expects to shoulder the blame. “This year they expect us to take a leap up and we didn’t have the year that is expected,” Lillard told The Undefeated. “Obviously, being a leader of this team, the ‘Top Dog,’ when it doesn’t go as planned, it’s going to come down on me. I guess I’m fine with that because my shoulders can handle it. Just like when things go well, I will be the first guy to get credit, I can be the first guy they point a finger at. Lillard recently talked to The Undefeated about his season, the Blazers’ playoff hopes, his rap career, his All-Star snub, his Powerade commercial campaign and more. You’re statistically having one of the best seasons of your NBA career averaging 25.9 points, 5.9 assists and 5.0 rebounds, but your team is struggling. With that in mind, can you feel like this is one of your best seasons? Individually, it is one of my best seasons. The numbers show that. Any really, really good player in this league can have a great season. But if it’s not translating to wins, then I don’t think you can consider it a great season. Our team hasn’t won as much as we’d like so far. But we’ve also had a lot of injuries. We have a young team. We traded away our starting center [Mason Plumlee]. We’ve had a lot of changes. We’ve gone through some things. Along with that, we haven’t won games. We’ve had close games and just haven’t won them. But it still can be a special season given the situation dropping out of the playoffs and fighting our way all the way back. We can still make a special season by getting in the playoffs and anything can happen from there. So I do think it is my best season, but it’s been overshadowed by our team not having as much success. What do the Blazers have to do to land the eighth and last playoff spot in the Western Conference? We just got to worry about ourselves. Sometimes you get so caught up in the standings. ‘Oh, hey, they play this team …’ ‘If we lose to them and then we win this game …’ It turns into a game of you watching other teams and who they might lose to. At the end of the day we know if we just take care of our business and take it one game at a time, we are going to be in position to get that done. That’s what we’ve been doing. We’ve been taking it one game at a time and now we have a little streak going. Even the last few games that we didn’t win, we played really good basketball games. I feel we are going to get that spot. Did you gain any motivation from your NBA All-Star snub? I’d be lying if I said I didn’t gain any motivation from it. It was one of those situations where last season it didn’t happen and I knew I should’ve made it. Last year, I was averaging like 25 points, seven assists and five rebounds and we were at maybe the seventh spot [in the West] at the [All-Star] break and I didn’t get in. I smacked my lips at it and thought, That’s crazy. But after it went through and I didn’t make it, that made it a lot easier this year. This year, I am having a better year. We are in the same position, basically. But going through it last year made it easier to deal with this year. It ain’t about me. There is some other stuff going on, and that stuff is out of my control. It gave me another situation where I had to power through. I had to wake up and show them that y’all did it to me again, but I got more to give. I am not going to back down and be overwhelmed by something like this happening. It is what it is. I dead all of that by getting back in the playoffs and making noise again. That’s what the plan is. How much boxing training do you do in the off-season? What advice did Hunter give you? In the summers, I usually do my fair share of boxing. Outside of basketball, I’d say it’s my next favorite sport. In the summers I do that to get conditioning in before I spend a lot of time on the court. Virgil was the trainer of the year this year. He trained Andre Ward, Andre Berto, Amir Khan. A lot of top boxers train at his gym. Him being from Oakland [California] was part of it. It was fun. We had a lot of questions about boxing and stuff I had questions about the different ways of training. After that, I feel there are a lot of things I can do in my training to make myself stronger in other areas that can help me as a basketball player as well. So it would probably be smart for guys not to put their hands up after a tough foul? That is definitely something we talked about. I’m not a person that is going to go picking fights. As a man coming from where I come from, it’s definitely necessary if something were to happen or if you ever were in a situation to be able to defend yourself. That doesn’t mean on the fly. You have to have some type of experience to have trained a little bit or know a little bit to train yourself. What is the latest with your rap career? When the season gets started, it gets put on hold. I put my first album [The Letter O] out in October. That’s been doing really well and [has been] very well received by not just basketball fans, but hip-hop fans period. A lot of people big in hip-hop supported it without doing much press with it. We just had to put it out there and use my partners off the court to push. When the season ends, we will see how that goes. I started my own label, got my own artists and they’re going to put some stuff out. Then when the summer comes, I know I’ll be in the studio doing some stuff. During the last four years you have hosted a community barbecue and picnic at Brookfield Park in East Oakland near your childhood home. Can you talk about your annual event and what you hope your community gets out of it? Brookfield was the neighborhood I grew up in. When I was young there would always be this big picnic. There would be a bunch of people there. A stage there. A bunch of artists would come out to perform. They would give out T-shirts. There was food, and it was always the best time in the neighborhood. A lot of stuff started happening at the picnic, so they ended up taking it away when I was younger. When I got into the league, I was talking to my cousins and my brother and everybody thought it would be cool if I brought back the Brookfield picnic. I brought it back. When I did it, I made it more of an Oakland thing. Obviously, everyone in the neighborhood was going to come regardless. But I made it more of an Oakland thing. We give away T-shirts, backpacks and school supplies. Face-painting. Haircuts. Women can get their hair done. We had a zip line, video game trucks, a fire truck tour, horse rides, food, everything. We give away shoes. We have a stage for the artists to do their music. There is a lot of stuff out there. It has been fun to have it and bring it back. It adds positivity. People have enough respect for me where nothing crazy is happening out there. Everyone respects me and everyone is having a good time. Each year we try to bring something new, upgrade it and make it better and better. Tell me about your latest commercial with Powerade? I wasn’t trying to get into a role or anything. It was actually my story. I saw some of the spots they’ve done in the past with other athletes and how it really related with their real-life story. I was a fan of those things, I was a fan of it and I decided to be a part of it. What do the words ‘Power Through’ in the commercial mean to you at the moment? At the moment it means being true to being the best version of yourself. Trusting that the hard work, passion and believing in myself will come through for me even in the hard times. We’re going through a tough season. Right now we’re knocking on the door of the playoffs even through these adverse times. It’s hard times and we’re powering through dealing with what we’ve had to deal with to be in this position to have action in the postseason. What message are you trying to portray in the commercials where you train on the basketball court and in the weight room? Hard work and the things behind the scenes that people don’t see. They see big performances, the income, the commercials. But a lot of time you’re missing what is going on behind the scenes with the work and the sacrifice. You see me do work on the court. You see me doing work in the weight room with Virgil Hunter. It shows the grit and the grind in the campaign showing how hard it is. It’s not easy to get to this level. You have to be committed and able to power through a lot of situations.